Be the first to share your favorite memory, photo or story of Ozetta "Ozzie". This memorial page is dedicated for family, friends and future generations to celebrate the life of their loved one. 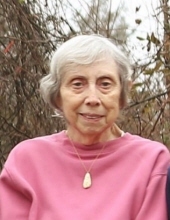 Ozetta M. “Ozzie” McGuckin, 81, of Gilbertsville formerly of Jeffersonville died Sunday, March 17, 2019 at home. Born in Wrightsville, she was the daughter of the late Raymond and Mabel E. Leiphart Young. Ozzie was a nurse at Chestnut Hill Hospital for 40 years. She is survived by her son, Ben McGuckin and his wife Lynn; 6 grandchildren; one great-grandchild and one sister, Lois Speicher. Memorials in Ozzie’s honor may be made to The Salvation Army Lessig-Booth Family Residence 137 King Street, P.O. Box 378, Pottstown, PA 19464. To send flowers or a remembrance gift to the family of Ozetta "Ozzie" Marie McGuckin, please visit our Tribute Store. "Email Address" would like to share the life celebration of Ozetta "Ozzie" Marie McGuckin. Click on the "link" to go to share a favorite memory or leave a condolence message for the family.